SOUNDING MY BARBARIC GULP! : I made bread! 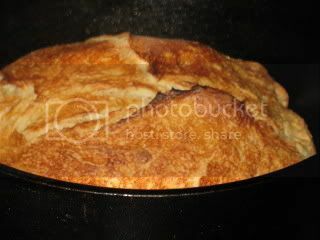 In November 2006, American cookbook author and food writer Mark Bittman published an article about no-knead bread in the New York Times. Apparently, it's been all the rage since. I've come across no-knead bread recipes on dozens of food blogs and websites, and I finally tried one yesterday. 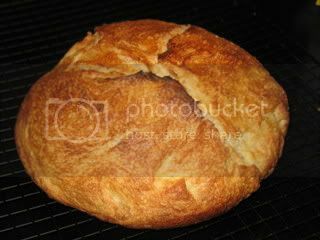 No-knead bread is a snap to make...all you do is mix a few ingredients together, let it rise for hours, then bake it in a Dutch oven. I can't explain how much I was impressed with this recipe...and myself for making it! The round loaf was crispy & brown on the outside and light & airy on the inside...very much like something you'd buy at an artisan bakery. No doughy bricks like I've ended up with in my previous bread-making attempts years ago! I will definitely make this again...with fresh rosemary and garlic next time! 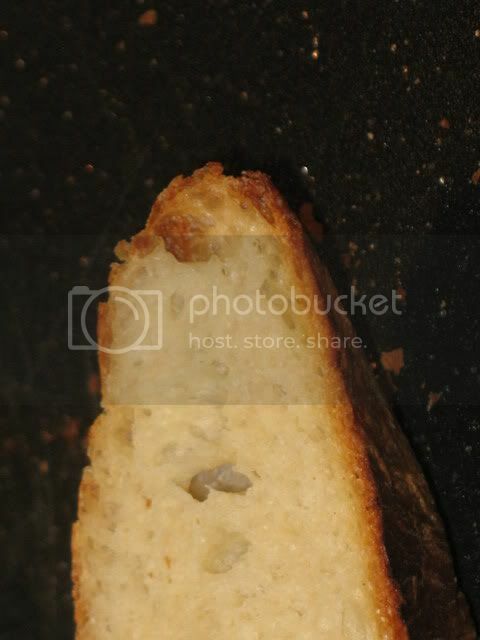 3/4 teaspoon regular yeast (not instant). I used "active dry" yeast. Mix all the ingredients in a big bowl. It will be a thick, slightly goopy dough. Mark Bittman calls it "shaggy." Cover with a towel or some plastic wrap and leave it in the warmest spot in your kitchen for a 6 to 8-hour rise. I put mine in the oven with the light on, since I have a fairly drafty kitchen. 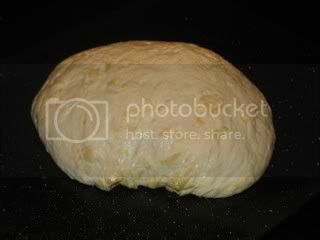 After the dough has risen, lightly oil the counter or a cutting board and turn dough out on it. Shape it roughly into a ball, drizzle a bit of oil on top & rub it around, and cover with a towel or plastic wrap. Let proof for at least another hour. 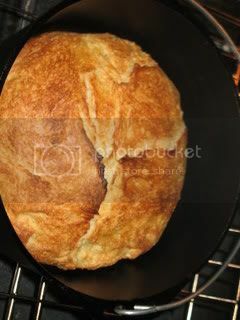 Put an oiled Dutch oven in the oven and heat to 450°F. I let mine heat up about 10 minutes. Put the dough in the pan. You may have to pour it, pry it off the baking sheet, or just roll it in - the dough is very wet. Don't worry if it looks a mess. 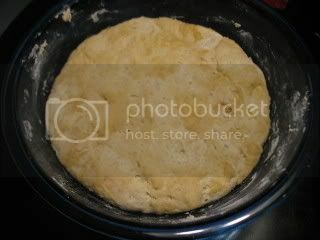 Cover the pot with a lid and bake for 30 minutes. Remove lid and bake for another 6-15 minutes to let it brown. Mine only took 7 minutes to brown, but the bottom was a little burnt. I ate a piece warm with butter, and I couldn't get over the fact that I'd made bread from scratch! You could easily make this any week day...just mix the dough in the morning, let is rise another hour as soon as you get home, then bake it while you prepare dinner. I don't think a dough can over-rise, so don't worry too much about that 6-8 hour time frame. I let mine raise another 45 minutes or so at first. And there are whole-wheat versions out there too! I am so excited about this recipe...and so looking forward to the pounds I am bound to gain now that I can have fresh bread whenever I want it! But I noticed you used cast iron, and I do have Great-Grandma's extra-extra-deep cast iron skillet with lid. 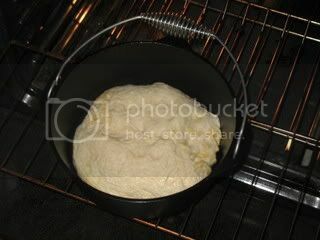 It doesn't look like the dough rises that much during baking; do you think the skillet would work? You're right...the bread doesn't rise much during baking. So, I think the cast iron skillet would work just fine! You really should try this bread! Right now all I have is bread machine / rapid-rise yeast. Should I go get some plain yeast? Also -- bread flour (extra gluten) or just plain white flour? You can use rapid rise, but you have to change the amount and proof time. You should be able to find recipes for no-knead bread that uses rapid yeast online. The recipe I used called for bread flour.